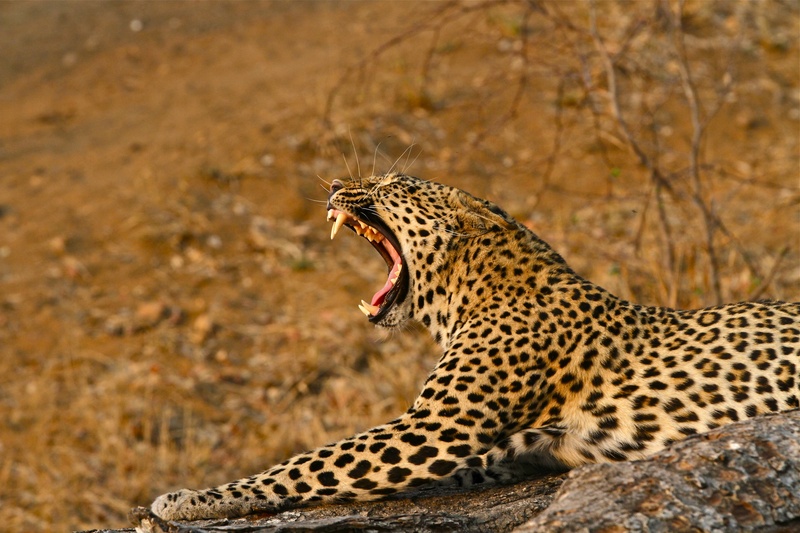 Leopards (Afrikaans name Luipaard) have to be the absolute beauties of the big cats. Their markings are so distinct and yet still allows them to disappear within seconds out in the bush, they seem to melt into the landscape. On our visits to Mala Mala Game Reserve we met up with quite a few of these georgeous cats, here is a young female that was high up in a jackalberry tree. A while later the young female leopard’s mother came by and called her out of the tree. This leopard was lying on a branch and I was lucky enough to catch her in a full yawn. This was a male leopard we met lying out in the bush. This was an old leopard kill that was still hanging up in a tree, in Kruger National Park.